Since its rise to popularity during World War II, Spam has come a long way. We took a closer look at some of the canned meat’s offshoots, from Spam Chorizo to Spam Oven Roasted Turkey. Spam was invented before World War II as a way of keeping Hormel workers employed year-round and creating a shelf-stable deli meat. When the war started, it was shipped to soldiers around the world because of its ability to maintain in global temperatures. Since then, a whole slew of flavored varieties have come into existence, comprising an entirely colorful universe of processed meats. 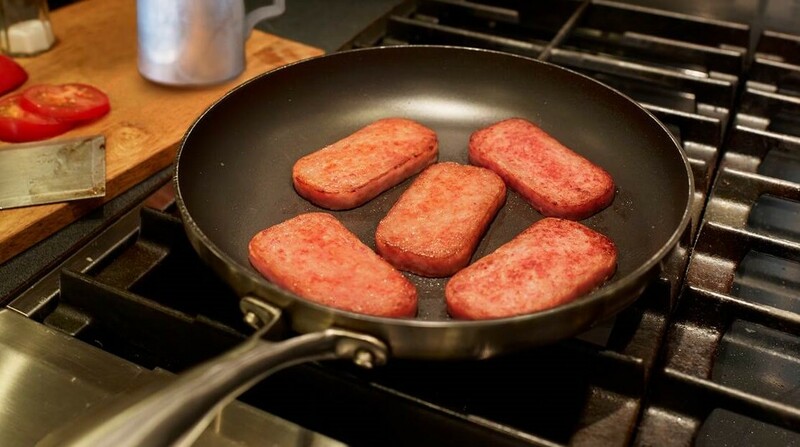 The first offshoots were Spam Hickory Smoke and Spam With Cheese, both of which hit the market in 1971. The line has expanded to include 15 flavors of Spam, ranging from the obvious (Spam Lite, which promises less fat, sodium, and calories) to the obscure (Spam Tocino, which is flavored after the popular Filipino bacon). The regular Spam—formally known as Spam Classic—is still Hormel’s top-selling brand, but according to brand manager Brian Lillis, they’re always on the lookout for new flavors. “We keep a strong pulse on the culinary and foodie scenes as well as listen to our customers to ensure each new variety created is versatile, easy to use, and above all, great-tasting,” he says. Spam BBQ? Spam Sriracha? The future may be thatexciting. In the name of journalism, I sampled an array of alternative Spams in order to help you out the next time you’re at the grocery store and looking to get weird. I almost always grill my Spam in a light teriyaki glaze, which prepares it for usage in Asian dishes like stir-fry or musubi (for which there is a recipe on the back of the Spam Teriyaki can). The teriyaki-infused Spam was very sweet, almost glistening with excess sauce. This was the obvious standout, as it’s how you might want to prepare your Spam anyways, though perhaps with a lighter amount of teriyaki than provided. Hormel offers a wide, wide variety of foodstuffs, such as chili, peanut butter, and, uh, Muscle Milk. But its bacon in particular, with its similarities to ham, makes for a natural crossover with Spam. When sliced thinly and cooked long enough to accrue a nice char, bacon Spam makes a decent substitute for standard bacon. It’s maybe the only variety you’d want to eat on its own, next to a plate of eggs and toast. Maybe I’ve been eating too much so-so Mexican food, but Spam Chorizo struck me as unbelievably close to the real thing, down to the strong paprika scent, the orange-ish coloring, and the peppery kick in the aftertaste. It tasted the least like standard Spam, as the chorizo seasoning was heavy enough to make me forget what I was eating. (The texture, however, was still Spammy; there was none of the gaminess of chorizo.) You could drop this on another breakfast plate, or maybe even stick it in some tacos, if you were ever so bold. Spam Hot and Spicy lives up to its name; the Spam is indeed hot and definitely spicy. (It’s flavored with Tabasco’s trademarked red pepper mixture.) In fact, it tastes almost exactly like regular Spam, except for a surprisingly strong heat that kicks in when you’re chewing. I can’t see it being in any way good for my digestive system, but there’s a nice novelty to it, if you wanted to incorporate this into musubi for an added kick.